Kia ora and Welcome to Term 2! THANK-YOU to all our families who have been referring their friends to us, and for your amazing comments on social media threads. We both really appreciate your ongoing support! We currently have spaces available in Parklands, North New Brighton, Kaiapoi and Oxford. If you know anyone looking for childcare in these areas, let them know we have fantastic, qualified home educators with spaces available. Please have a look at the child health policy. We want to keep illness to a minimum this winter for the children and teachers. Please keep your child at home if they have no interest in play, have a temperature of 38 degrees or over, have had diarrhea or vomited in the last 48 hours or have a bad cold or cough (clear runny noses are fine, as this can be a constant in winter). Let’s keep everyone healthy! Our hope in creating this form is to give parents and caregivers more formal input into their child’s individual learning. Please do take the time to express your wishes and hopes for your child’s learning for the upcoming year. These will be emailed out each year during the month of your child’s birthday. We ask these to be emailed back to Louise, who will then share them with your educator. We will start this process in June, if your child has already had a birthday this year you will also get a form in June. 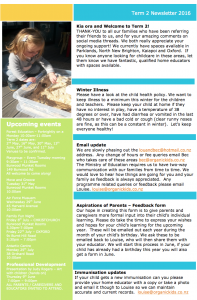 Click this link to download our full newsletter.